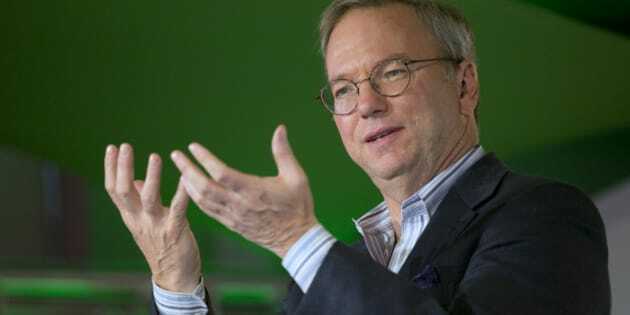 TORONTO - Google's executive chairman Eric Schmidt made a rare visit to Canada on Wednesday, to help announce a $1.5 million grant to support the educational charity Actua and speak at an event promoting his new book "How Google Works," written with Jonathan Rosenberg, an adviser to CEO Larry Page. In an interview with The Canadian Press, Schmidt talked about the company's growing presence in Canada, going up against former privacy commissioner Jennifer Stoddart, and his unabashed love for BlackBerry. CP: What is Canada's reputation within Google, what are the offices and employees in Waterloo, Ont., Montreal, Ottawa and Toronto known for? Schmidt: We have something like 400 engineers and something like 700 or 800 employees here and I always knew Waterloo was a fantastic engineering centre. What's recently happened is the University of Toronto and Montreal have become real centres for machine intelligence. So within Google in the U.S., we're hiring people from Canada to solve the fundamental problems of artificial intelligence and that's a new fact. It didn't used to be, you tend to think Waterloo was a programming languages university and they broadened what they were trying to do. CP: Are there any plans to open more offices in Canada? Schmidt: I think at the moment we have enough, what we're trying to do is get these offices to be bigger and bigger and bigger. I would've liked to have had lots of offices everywhere but we get benefit by having everybody in a few places. CP: To what extent has Canada been a challenging market for privacy issues, with our privacy commissioners aggressively going after Facebook and Google to push for more safeguards for Canadians? Schmidt: I don't think it's been unusual, we have issues in every country and our basic strategy is to work with the government. We don't fight them, we try to solve the problem. But Canadians are very similar culturally ... so there's not much issue, we have problems in lots of other countries, I don't think of us as having trouble in Canada at all. CP: What's your current smartphone? Schmidt: Motorola Razr X. As you know, Motorola is in the process of being sold to Lenovo but this is in fact the phone that I use. CP: You were a noted BlackBerry user, what made you switch? Schmidt: Well, I need to carry this. I still like BlackBerrys but I'm afraid they missed a set of transitions that were very important and the new CEO is trying very hard to recover. But the fact of the matter is that Android and iPhone are driving the market now. CP: Do you miss the keyboard? Schmidt: I have always liked the BlackBerry keyboard. CP: Did you ever go the Google engineering team and say, "Listen, I love the BlackBerry, there's a lot of powerful people out there that like the BlackBerry, why don't we make a product that's like the BlackBerry but made by Google and better?" Schmidt: Google, remember, largely makes the software and it's up to the hardware industry (to make a BlackBerry competitor). BlackBerry has made its keyboard intellectual property and you can't just copy it. Later, at his speaking event with the Empire Club of Canada, Schmidt admitted he still does carry a BlackBerry in addition to his Motorola phone. The grant Actua is receiving from Google will help launch a program called Codemakers, with a goal of teaching 100,000 Canadian kids about coding software and working with cutting-edge technologies. Over three years, Actua plans to run summer camps and school workshops across the country, with a focus on reaching underserved populations including girls, aboriginal youth, children of immigrants and kids from homes facing socioeconomic challenges, says chief executive Jennifer Flanagan. "What we're really trying to do with the Codemakers initiative is bring kids from the place of being very great consumers of technology to actually giving them the skills to be producers of technology in the future," says Flanagan. "Knowing that they're using this technology at a very young age we want to tell them how it works and give them the skills so we put them in the driver's seat in the future."